As I had said I really wanted to make some felt, so I did : ) I have never really made individual flowers before as one pieces, I normally make a big piece and cut them to what I want, but this seemed to work quite well. I know the red is awful to take photos of, but you can see the centre quite well on this one. I hope to be listing some bags tonight at least four, or maybe six if I can finish the two that are half done! Those are beautiful poppies! Lovely style, will they be on a bag? What can I say but WOW! The poppies are so beautiful – I am such a big fan of your work. They are really beautiful works of art. I love the poppies with their beady centres and I think the red has photographed well. 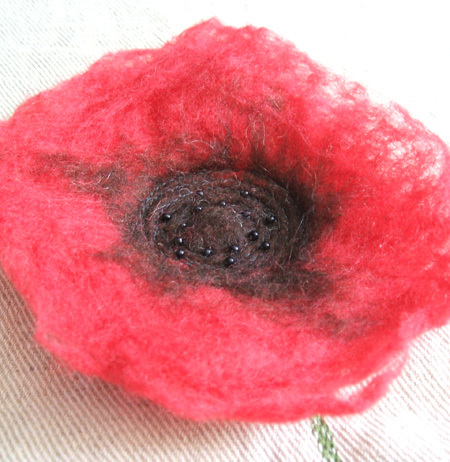 These are beautiful – I have always loved your felt work! Wondeful! It’s look sooooo pretty. I want to add your site into mine. Thanks for being inspired for to learn felt art craft. Gosh- my boss would love this. She adores beads and her favourite flowers are poppies! I shall have to send this to her!! These poppies are so pretty! Just love the happy colour and the way you made them! One of my favourite flowers are poppies (It’s even my blog name). 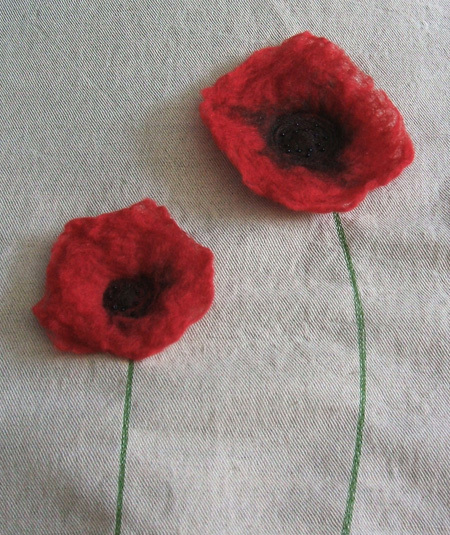 I loved your felt poppies, maybe one day I will try to make one myself. But for now I’m waiting for the appropriate season for the poppies to burst out from everywhere.